Based on a traditional Roman recipe that adds a pinch of fiery chilli with ripe tomatoes, rich peppers and Filippo Berio Extra Virgin Olive Oil, our Hot Chilli Pesto is made for an extra tasty kick! Stir through pasta or noodles for an instant chilli treat, use as a topping for bruschetta, or to add some spice to sandwiches and wraps. 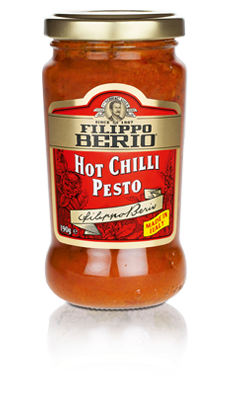 Filippo Berio Hot Chilli Pesto is great added to mayonnaise, sauces and soups to deliver a fiery twist and it’s perfect spread on pizza or spooned through rice. Perfect for food lovers who like things a little hotter.